Minister for Parliamentary Affairs and Science and Technology Ashwani Kumar today stated that a 50-bed old age home would be set up in the town with the help of the Punjab Government’s Department of Health and Social Welfare. Prominent religious, social, political personalities and people from different villages gave an overwhelming response to the charitable hospital project, envisaged by an octogenarian social worker Budh Singh Dhahan. An Amritsar-based NGO, Udaan Trust, has donated two fully equipped ambulances to the Gurdaspur police, which will help take the accident victims on the Gurdaspur-Batala and Gurdaspur-Kahunwan roads to hospitals. After arresting all the five members of a robbers’ gang, which carried out the Rs 40-lakh Apra heist, the Jalandhar (Rural) police would hand over this case to the Phillaur police for further investigation and tracing the looted gold jewellery. A London-based NRI, Baljeet Bassi, died under mysterious circumstances at his room at the local Hotel Maya here yesterday. According to the information, Bassi had reached India a few days ago and was putting up in the hotel. The suspicion about his death arose when waiters knocked his room on Saturday morning but did not get any response from inside. The city police arrested Mantu Gill, block president of the Youth Congress (Urban), for gambling and recovered Rs 80,000 from his possession here on Saturday. A resident of Neelamahal, Mantu along with eight others were nabbed from a house situated in the local Workshop Chowk. SHO Sukhdeep Singh said they acted on a tip-off and nabbed nine youths. “A case under the Gambling Act has been registered against them,” he added. Addressing a press conference, Ashwani Kumar said such a venture was coming up in this district for the fist time. It will primarily cater to inmates from rural areas where proper care was not being given to them due to several reasons. The district administration has already identified a two-acre piece of land near Babri village, barely 2 kms from here. The minister asserted that he would be sanctioning an amount of Rs 1 crore from his MP Local Area Development Fund scheme for the old age home. Responding to the repeated requests of residents of Pathankot, the minister said he had taken up the issue of renaming Chaki Bank railway station to Pathankot Cantonment railway station with the Union Railway Minister Mamata Banerjee. He said the Punjab government had already sent a request to the Railway Ministry in this regard. Ashwani Kumar added that the Congress would be sweeping the forthcoming assembly elections in the states of Kerala, West Bengal and Assam because of the “myopic policies of the ruling communist governments in these states.” However, in the same breath, he added that the Congress would have a tough fight on its hands in the Tamil Nadu assembly elections. “There is a massive groundswell of the anti-incumbency factor in Kerala, West Bengal and Assam which will be translated into votes for the Congress party,” remarked an overly optimistic Ashwani Kumar. The minister added that the Hyderabad-based Indian National Centre for Ocean Information Services (INCOIS), which falls under the Science and Technology Ministry currently headed by him, was constantly updating him on the effects of the tsunami on India, particularly the Andaman and Nicobar Islands. “Earlier, when the tsunami-hit Japan, there were apprehensions that Andaman and Nicobar islands would also have to face the brunt. However, later I was informed that the tsumani waves had changed direction from its epicentre which somewhere between East Indonesia and East Philippines. In any case a Disaster Management Cell was immediately set up which was being run by the Union Home Ministry,” remarked the minister. People donated cash and kind worth more than Rs one crore on the occasion of the foundation stone laying ceremony of Guru Nanak Mission Charitable Hospital at Nawangran-Kulpur village here on Sunday. Affectionately known as Babaji, Dhahan undertook the project under the aegis of Guru Nanak Mission International Charitable Trust, Nawangran-Kulpur, for providing better healthcare services to the people of the backward and remote Kandi area falling in the Shahid Bhagat Singh Nagar, Hoshiarpur and Ropar districts. The panchayats of Nawangran and Kulpur villages donated 18 and 7 acres of land, respectively, for the project. The trust has purchased 10 acres of adjoining land for setting up a hospital equipped with ultramodern healthcare facilities on par with international standards. 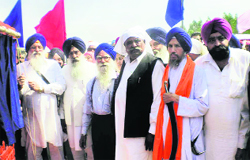 Eminent personalities, including SGPC president, Avtar Singh Makkar, Sant Baba Labh Singh, Inderjit Kaur, president, All-India Pingalwara Society, Amritsar, Sarup singh Alag, Alag Shabad Yag International Charitable Trust, Ludhiana, Harjinder Kaur, former Mayor, Chandigarh laid the foundation stone of the hospital. Giving details, Baba Budh Singh Dhahan, said that in the first phase, 50-bed hospital at a cost of Rs 10 crore would be set up by mobilising donations from philanthropists from here and abroad. The trust has been organising public meetings at different villages for mobilising active cooperation of the people. Besides, free medical check-up camps are also being organised by the trust. Baba Budh Singh Dhahan had set up Guru Nanak Mission Medical & Educational Trust, Dhahan Kaleran, about three decades ago and mobilised donations in crores for providing better healthcare and education facilities to the rural people. SGPC president Avtar Singh Makker and MP Avinash Rai Khanna announced grants amounting to Rs five lakh each. Varinder Kaur Thandi and sangat of Dyal village donated a sum of Rs 2.65 lakh each for the project. The Nawangran village also announced to bear the expenses of construction of seven rooms. The residents of a number of villages bee-lined for donations and a sum of Rs 16 lakh was collected on the spot. The ambulances were flagged off by the Gurdaspur SSP in the presence of Udaan Trust employees, at the Babri bypass on the Gurdaspur-Batala road this morning. The function was organised by the Traffic Education Cell in charge, ASI Raj Kumar. The trust will provide drivers and other paramedical staff, which will be on round-the-clock duty in the ambulances. The Jalandhar (Rural) police arrested Deepak Kumar, alias Deepa, one of the last members of the gang from his native Apra village on March 11. Deepa has been sent on judicial remand till March 26. While another accused in this case, Jagjit Singh, alias Sabi, a resident of Dakoha village, from the local Rama Mandi area was arrested on March 7. Talking to The Tribune, DSP (Detective), Jalandhar Rural, Harkamalpreet Singh Khakh said the Phillaur police would re-arrest the gang on production warrant within a day or two. “Last week we acted on a tip-off and arrested three of the five members of the gang. The other two who were at large have also been arrested. Now, further investigations pertaining to the recovery of the looted jewellery and its status would be dealt with by the Phillaur police,” he added. It might be noted that last Sunday, Inspector General, Jalandhar Zone, RP Mittal had conducted a press conference confirming the arrest of three members of the gang namely, Jagjeet Singh alias Dhami of Begampur Jandiala, Pradeep Singh, alias Soni, of Hariana village (both from Hoshiarpur district) and Ranveer Singh, alias Gandhi of Bhogpur, in Jalandhar district. The police had also recovered weapons and vehicles used in the Apra heist from the possession of the trio last week. The Rs 40-lakh heist had taken place at Ghai Jewellers at Apra village near here on February 11. The same gang had also attempted to loot a city-based Prahlad Jewellers on February 26. SHO New Baradari police station, Onkar Singh said, “The hotel authorities informed us. On opening the room we found his body and recovered heroin kept near it,” he said, adding that prima facie, it seems that the NRI died due to overdose of heroin. The police has sent the body for the postmortem examination to the local civil hospital yesterday. “Now, we have sent his viscera report for further clinical examination to Kharar. While his body was handed over to his family today,” he added. Phagwara: Safai karamchari Gurdev Kaur of Jamalpur village was found dead in mysterious circumstances in a drain near the village today. Working at a private hospital in Urban Estate, she left for her residence in the night but did not reach home. The police is investigating the matter to find out whether the matter was related to suicide, murder or natural death. The deceased’s body was sent to the local Civil Hospital for post-mortem examination to trace the cause of the death. Tarn Taran: Five persons died in different mishaps. Gurnam Singh and his brother Lakhwinder Singh of Chaukian village (Ferozepur) died on the spot near Nathupur village, 30 kms from here, late last evening. They were coming to this side on their bike when it was hit from the back by an 18-tyre truck. The Harike police registered a case under Sections 304A, 279 and 427 of the IPC against the driver of the truck, who escaped after the incident. In the second mishap, Jaidev Singh (18) of Patti township died on the spot near Sarhali village, 20 kms from here. Jaidev lost control over his car when some stray animal came in front of the vehicle. His car struck a roadside tree. The Sarhali police lodged a report under Section 174 of the CrPC. In another incident, Sulakhan Singh of Fazalpur village, 25 kms from here, was electrocuted while working in the fields. The Verowal police lodged a report under Section 174 of the CrPC. In another incident, Bhang Singh, of Kot Dharam Chand Kalan village, who received serious injuries in a road accident near Palasour village, five kms from here, succumbed to his injuries at a hospital last evening. A car had hit his motorcycle three days ago. Bhang Singh received head injuries. His cousin Baljit Singh too was injured in the accident. The police registered a case under Sections 279, 427, 337, 338 and 304A of the IPC. The driver of the car fled away.